This entry was posted on Friday, July 30th, 2010 at 7:38 PM	and is filed under Medieval, Modern(ish), Treasures. You can follow any responses to this entry through the RSS 2.0 feed. You can skip to the end and leave a response. Pinging is currently not allowed. Who knows what they meant by “it went to a Douglas.” I fear it was just some jackass named Doug. I’m actually surprised Scotland let the sword be sold without protest. The piece has such a profound link to the birth of the country. If it’s gone to a Douglas then put it on show in a Scottish museum…he’ll be turning in his grave knowing it’s in England! True that. Although as far as we know the Douglas who bought it is British. I’m a Douglas and very proud of my family name. I live in the USA, but am coming to Scotland I do wish the sword was on display. The sword was in the Glenn family for many years. David Glen of Lochwinnoch Scotland gave it to his two sons, John and James Glen, and they took it to Northern Ireland in the early 1600’s. Would Sir James Douglas have worn a kilt? I am writing a historical novel and am curious. Why assume that the Douglas who bought the sword is from England? Douglas is a Scots surname, so the new owner may be from Scotland. By the way, the Bruce did not preside over the ‘dawn of an independent Scotland’. Scotland had been independent for centuries before the short English occupation. The Bruce re-established that centuries old independence. 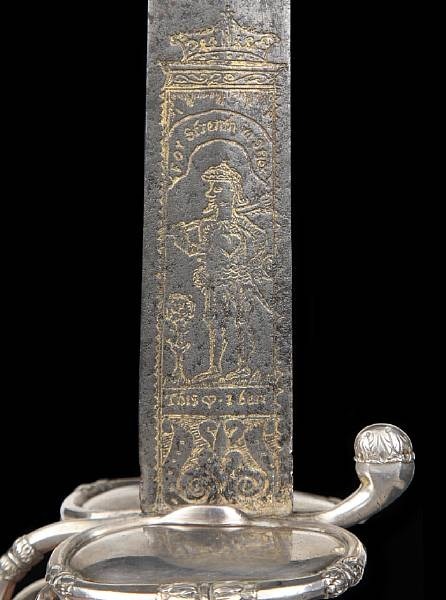 our family in CT had a sword that belonged to James Douglass and was believed to have been in the battle of London derry.